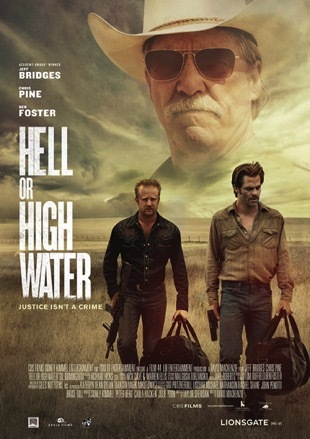 Following a series of armed robberies at a number of branches of Texas Midland Bank where very little money was taken, we learn that the motive of unemployed oil and gas worker Toby Howard (Chris Pine) and his brother -- just released from prison -- is to raise enough money to pay off the reverse mortgage that will forfeit their recently deceased mother's ranch if not paid off. Oil was discovered on the ranch and in order to secure the future of his sons and ex wife, Toby needs $43,000. After two of the robberies, curmudgeonly Texas Ranger Marcus Hamilton (Jeff Bridges) and his American Indian deputy partner pick up the trail and and a showdown seem imminent. What do you make of the film’s title? In what way did the cinematography of the movie enhance or distract from its themes? The politically incorrect relationship between Marcus and his Comanche-Mexican partner Alberto was fascinating to follow. What made it believable? How did the main characters respond to the dreadful reckoning unfolding in the movie? The tense ending, a revealing conversation between Marcus and Toby but fraught with potential violence, refers to a possible second meeting. What do you expect happens ‘after the credits roll’? Is there a line or quote from the movie that struck you? The Toronto Star: “There is law and there is justice, and the two don’t always meet in the straight-edged way the endless horizon and eternal sky do in West Texas.” What kind of justice was done? What is the legacy that Toby leaves his sons? What is the film saying about the ‘American Dream’? How can the ‘boom-gone-bust’ setting help explain the rise of Trump? Is this film mainly about relationships, on both side of the law, or about a decline of a way of life, or something else? From the film’s point of view, is redemption possible? If so, what might it look like? Where do you find hope when the structures and society around you seem inadequate, corrupt and ‘passing away’?